Harsh Agarwal(of Shoutmeloud) is a professional blogger. Are you also a pro blogger? Because you may be a high school student or a job seeker who want to earn some extra cash online without any investment. And if you are one of them, then this is a must read guide for you. The following is the table of content of this article which you can use to navigate throughout the headings. Why should You do auto blogging? How to auto blogging on Blogspot using IFTTT and RSS feeds? Can you SEO optimize your blog posts? How to share the new blog posts on social networks automatically? How To monetize your blog and make money on the fly? What are the best Adsense alternatives to monetize your blog? 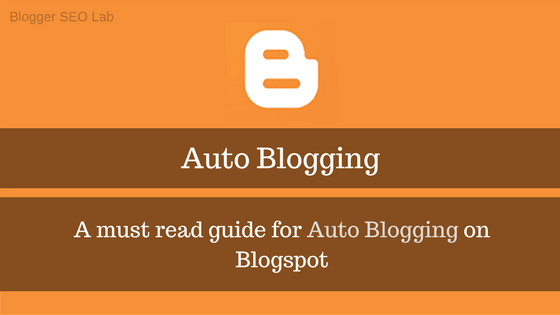 Auto blogging is a process of using an automated software which scrapes the content from the RSS feeds of another website and then republish the same on your Blogger and WordPress. This automatic blogging process requires no work because it generates its contents from the various website like BuzzFeed. You no need to work because it generates its contents. You can make a lot of money day and night. You need not be an SEO expert. You need not be a technology guy. There is no cost to maintain the blog because it is free. You see that the process is too easy and it also makes you a lot of cash every month. Now let's see the step by step guide. As we already know that a WordPress is the perfect solution to automate our blogging task using thousands of free plugins. But, You can't enjoy these privileges on Blogspot. Do you know why? Because it has the lack of features. 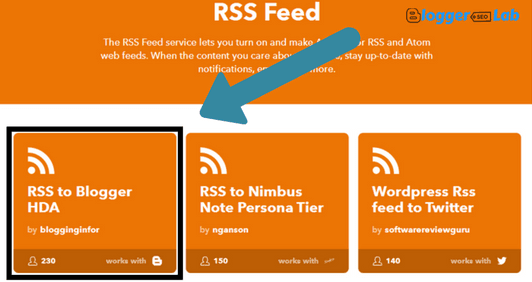 Hopefully, there is some third party web applications and their tweaks available which you can use to automate your blog posts using RSS feeds (or Newsletter) and Email. And in this guide, We will do the same. Note: You need to create an email on Gmail and a blog on Blogspot, an account on IFTTT yourself. This is a very easy task. 1. The very first thing you need to do is to get an RSS feed of a website. As I already specified that, in this guide, I would use Google news feed. So, the below is the RSS feed of Google. You can also use the below Google News Feed for your blog. 2. Now, login to your IFTTT account. Now we have to create an applet. Creating an applet is a straightforward task. We only need to create trigger-based automated tasks, which will be executed for you automatically when the conditions are fulfilled. Now when you are on IFTTT dashboard, then navigate to 'My Applets' (located in the menu bar) > Services. And, you need to select 'RSS Feeds.' 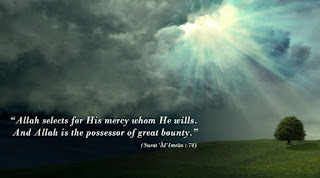 See the below picture. 3. Now, in the next step, you need to select 'RSS to Blogger HDA.' See below picture. 4. Now, you need to turn on the applet, Just click on 'Turn on'. See below picture. 6. Now the process is almost over. In the next, you need to enter the RSS feed URL. As in my case, Google News Feed like below. And then, click on SAVE. You have successfully set up an auto blogging software or poster. Now, When Google News has a new article, then it will automatically be posted on your Blogspot. Now, in the next part, we will discuss on 'How to SEO optimized your blog?' so that your blog would get a massive amount of organic traffic that will boost your earnings. Now, You have a blog and also 200 or more articles. Now, it's time to drive a massive amount of traffic to it. SEO takes time and patience to rank a blog and website at the first page of the Google search. There are thousands of ranking factors, and one of them is Unique and High-quality articles. Google hates the duplicate contents and will not let you to rank. Then there is only one way remaining that might drive a lot of traffic to your blog, and that is social media. We know that Google News is one of the biggest news network which publishes its articles in every 1 minutes or less. That means, in one day your blog may have 1000 articles. And sharing all the posts one by one is not so easy. So in this case, we like to use auto sharing tool which shares your articles automatically when a new article gets published using your RSS feed. "You can't use Adsense on a blog where contents are copied or scraped from the other sites." Hopefully, there is some best Adsense alternative available which allows duplicate contents. And one of them is 'Popads.' I have also published a review on Popads with earning and payment proof, you can read from here. 1. Infolinks: It’s an in-text advertising program which does not occupy too many spaces on your site. It provides pop-up ads or text ads. 2. Media.net: It also a contextual ad network which is powered by Yahoo and Bing. You can customize your ad with different color and size. 3.Bidvertiser: It is a CPC (cost per click) advertising programs which let your earn revenue by showing Slider ads, Banner ads, Mobile Ads, Text ads. Creating a blog is a straightforward task but making it popular too hard because it requires a lot of hard work, patience and time. Auto Blogging becomes one of the best ways to make money from blogging because here you no need to work day and night. You only need to create it, monetize it and leave it. And, a good amount of cash will be in your pocket every month.